Contributed By: Shirin Herzog, Ron Gazit, Rotenberg & Co.
Editors’ Note: Contributed by Shirin Herzog, head of the Mergers and Acquisitions, Securities and International Transactions Department in the Israeli firm of Ron Gazit, Rotenberg & Co. Ms. Herzog handles a variety of Israeli and cross-border merger and acquisition transactions, for public and private companies, and private equity transactions. This post is based on a recent blog post by Ms. Herzog first published in The Times of Israel on November 30, 2017. Known from ancient times as a land of milk and honey, nowadays the nation of Israel is also a nation of opportunity. The law commonly referred to in Israel as the “Concentration Law,” requires investors deemed to be overly concentrated in the Israeli market to sell or take other actions regarding prime assets. By the same token, these investors may also be restricted from acquiring further Israeli assets. While some existing players in the Israeli market (mostly Israelis) may be harmed by the law, it has created significant opportunity for new players. In the four years since the law was enacted, we have witnessed a considerable number of transactions driven by its requirements. The law set up a few milestones, the first is December 10, 2017, by which Israeli conglomerates having multiple layers of publicly-traded subsidiaries (legally existing structures, also known as “pyramids”) must be flattened to a maximum of three layers of public companies; by way of sale, going private, redemption of public debt, merger, etc. The last conglomerate to comply with this requirement was the IDB Group. On November 22, 2017, just days before the deadline, IDB Development sold its controlling interests (71%) of Discount Investments to a private company held by Eduardo Elsztain, who is also the controlling shareholder of the IDB Group. Accordingly, Discount Investments remained a publicly-traded company, but became a sister company of IDB Development, instead of its subsidiary – removing one public layer at the pyramid’s top. Those who closely follow the Israeli financial media surely know there’s nothing like IDB to kindle populist debate and criticism of politicians and journalists alike. This deal was no exception. Many argued that the deal’s structure and financing breached the Concentration Law’s letter and spirit, and some even called for legislation of deal-blocking regulations. I have a different take on this situation. A thorough analysis of the Concentration Law (formally, The Law for Promotion of Competition and Reduction of Concentration of 2013), together with its explanatory notes, leads me to conclude that the deal breaches neither the law nor its spirit. The specifics of the analysis deviate from the scope of this piece, but in a nutshell, the provisions relating to pyramid-flattening cover only the number of public layers and they do not restrict transactions within a conglomerate that meet this number of layers criterion. Unlike the other components of the law described below, neither separation of assets held nor concentration considerations apply. Moreover, any legislation restricting the manner of doing business should be interpreted narrowly and should not apply retroactively. The Concentration Law has already significantly succeeded in reducing the number of layers in many Israeli public-companies’ pyramids. According to a study conducted by the Israel Securities Authority, as of September 2017, only 13 companies kept the third to fifth layers of pyramids, compared to 67 such companies upon commencement of the preparatory process of the Concentration Law’s legislation in 2010. The IDB Group, a perceived catalysator of the law, had seven such companies in September 2017, compared to 27 in 2010. 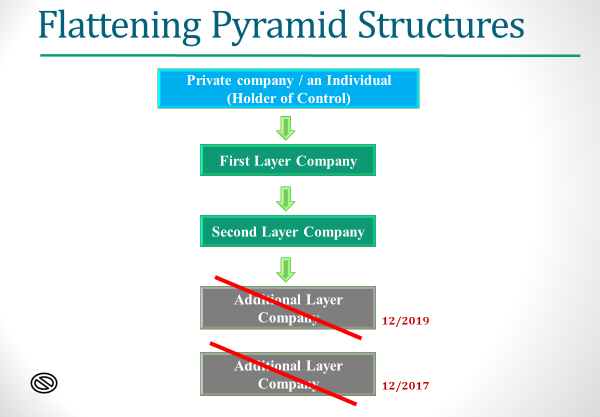 The recent IDB deal reduced a layer at the top of the pyramid, turning four “third-layer companies” into “second-layer companies,” no longer restricted by the Concentration Law. Thereafter, IDB still has three companies in the pyramid’s third layer. The second milestone under the law is only two years away. By December 10, 2019, pyramid structures should be further flattened to no more than two layers of public companies. By that deadline, another component of the Concentration Law also becomes effective. It relates to separation of cross-holdings of mega Israeli financial companies (generally, companies managing assets exceeding NIS 40 billion; US $11.4 billion) and mega Israeli “real” (namely, non-financial) companies (generally, companies having revenue or debt in Israel exceeding NIS 6 billion; US $1.7 billion). Two years may seem like a long time, but it is not. Considering the market conditions, the harsh sanctions on a breach (forced sale by a trustee) and the precedents in recent years, especially in the regulated insurance space, selling such assets could take a long time – and no seller wants to resort to a forced sale at the last moment. Much like a game of musical-chairs, no one wants to remain standing when the music stops. Indeed, we are already seeing many transactions and separation actions in the market. The Delek Group (concentrating on gas, oil and real estate) has attempted to sell its Phoenix Insurance Company several times, as did the IDB Group with its Clal Insurance Company. Alas, the potential buyers did not stand up to the regulator’s standards. Apax Partners sold Tnuva Dairies in a well-orchestrated deal in 2015, ahead of the curve. In another case, Bino Group, the controlling party of both The First International Bank of Israel and Paz Oil Company, was bound by the Concentration Law to choose between these two prime assets, and opted to decrease its holdings in the latter company. In parallel, seeds of the third component of the Concentration Law are starting to bud. Under that component, overall-market concentration and sectoral competitiveness considerations must be taken into account when government rights or assets, such as telecommunication licenses or exploration concessions, are allocated. A pioneering example was the restriction of The Israel Corporation from entering the emerging field of oil-shale exploration. The Concentration Law is unprecedented both in its widespread effect over the Israeli economy and in the aggressive remedies it applies to increase competition in the allegedly-concentrated market. The law does not include “grandfather clauses” exempting existing structures and holdings, resulting in Israeli investors being forced to sell or take other actions regarding prime assets within a limited time. All the while, these Israeli investors may also be prohibited from acquiring further Israeli assets, consequently shifting investments and debt out of Israel. The good news is these restrictions on current players in the Israeli market create opportunities for new players. From the perspective of non-Israeli investors, the Concentration Law constitutes a regulatory springboard, giving them an advantage over existing concentrated players. Opportunity is certainly ripe for newcomers to the Israeli market. The above does not constitute legal opinion or an investment recommendation. Editor’s Note: David E. Tadmor is a member of XBMA’s Legal Roundtable and the Co-Managing Partner of Tadmor & Co. Yuval Levy & Co. Mr. Tadmor is recognized as a leading expert in the area of Israeli competition law. He served as the Director General of the Israel Antitrust Authority (IAA) from 1997 to 2001. Shai Bakal, head of Tadmor’s Antitrust/Competition group, and Tadmor Antitrust/Competition partner Nava Karavany authored this article with associate Michal Olivero Kornfeld. Executive Summary: Memorandum published by the General Director of the Israel Antitrust Authority earlier this year proposed reform that reflects a considerable expansion in the application of Israeli antitrust law to mergers between foreign corporations, as well as mergers involving Israeli and foreign corporations (including the acquisition of an Israeli corporation by a foreign corporation with no previous ties to Israel). Current guidelines of the IAA mandate the General Director to supervise mergers involving foreign corporations that are not registered in Israel in cases where a nexus could be determined to exist between the foreign corporation and Israel. The new proposal foregoes the nexus requirement, by defining “Corporation” as any foreign corporation. This article discusses such proposal as well as additional proposed changes included in the memoranda. At the beginning of April 2015, the General Director of the Israel Antitrust Authority (the “General Director”) published memoranda of legislation calling for an amendment of the Israeli Restrictive Trade Practices Law, 5748-1988: memorandum of the Restrictive Trade Practices Law (amendment to mergers section and various provisions), 5775-2015 (the “Memorandum”), proposing a significant reform in the merger control regime; and memorandum of the Restrictive Trade Practices Law (removal of import barriers), 5775-2015, calling for the impositions of the special duties that are currently applicable only to monopolies, to authorized distributors that do not hold monopoly positions, where their behavior impairs or impedes parallel import. The main changes proposed in the memorandum are detailed below. Currently, the literal definition of a “Merger” in the Israeli Restrictive Trade Practices Law applies to mergers between corporations incorporated in Israel and to foreign corporations that are registered in Israel. Until now, the General Director applied his authority to regulate mergers involving foreign corporations that are not registered in Israel by interpretive means, in cases where nexus could be determined to exist between the foreign corporation and Israel. Guidelines published by the General Director state that a merger involving an unregistered foreign corporation would fall within the definition of “Merger” if such foreign corporation has substantial holdings in Israeli corporations or if it conducts business in Israel, including through local representatives that are subject to the foreign corporation’s influence. The current proposal wishes to cancel the need to prove nexus to Israel by defining “Corporation” as any foreign corporation. In this respect, the proposed reform reflects a considerable expansion in the application of Israeli antitrust law to mergers between foreign corporations, as well as mergers involving Israeli and foreign corporations (including the acquisition of an Israeli corporation by a foreign corporation with no previous ties to Israel). Due to the potential consequences of this change on foreign investments in Israel, it would be advisable to have a thorough discussion and consider amendments to the Memorandum. The General Director proposes to amend the definition of “Company” so that Israeli merger control would not be affected by the form of incorporation, and would include mergers where one of the parties is an individual, an unregistered partnership (including a foreign partnership) or an association. Presently, the definition of merger applies only to some of the abovementioned forms of incorporation and to some transactions involving individuals (by way of interpretation). Presently, a merger that fails to meet the minimum threshold for pre-merger notification is immune from intervention, and the parties to such a merger may consummate the transaction even if it entails significant competitive harm. The General Director proposes to effect a substantive prohibition on any merger that raises reasonable concerns of significant competitive harm or harm to the public. If accepted, this amendment could subject parties to a merger to criminal liability and administrative sanctions, and enable the General Director to order the dissolution of the merger, even if the parties thereto did not have a duty to notify the General Director of the merger, if it is determined that such merger raised reasonable concerns of significant competitive harm. Naturally, this provision creates a great deal of uncertainty, especially due to the fact that in many cases the information required for a full competitive analysis of the merger is not available to the parties prior to the entering into the merger agreement or the consummation of the transaction (for example, information acquired by the General Director from third parties). The costs of such analysis in themselves may deter parties from executing merger transactions. Mergers that give rise to competitive concerns are sometimes approved subject to certain conditions; however, where there is no requirement to file a merger notification, the merging parties are in fact denied the opportunity to receive a conditional merger approval. To resolve this issue, under the proposed regime, parties could voluntarily file a merger notification, and the General Director would have 15 days to notify them whether or not he intends to review the merger. A negative response or no response will be deemed as an unconditional approval of the merger. The General Director proposes to update the minimum thresholds requiring pre-merger notifications. The current minimal joint turnover threshold in Israel of both parties is ILS 150 million (around USD 38M), and is proposed to be raised to ILS 250 million (around USD 63M). The other minimal turnover threshold relates to at least two separate merging parties, and it will remain ILS 10 million. The General Director proposes that even if this threshold is not met, if one of the parties to the merger has a worldwide turnover exceeding ILS 1 billion, a filing of pre-merger notification will be required. A pre-merger notification is also required where the merger would create a monopoly or if a party to the merger is already a monopoly. The General Director proposes adding a condition to this requirement, requiring that the merging parties have a joint turnover of at least ILS 100 million (around 25M USD). This new condition would decrease the number of transactions requiring merger notification, but as explained above, such mergers will still be subject to the substantive test. Currently, the Israeli Restrictive Trade Practices Law allows the General Director 30 days to decide whether to approve a merger. In order to extend the 30-day period, the General Director must receive the approval of the parties to the merger or the Antitrust Tribunal. The General Director’s view is that such 30-day period is not sufficient in order to review complex mergers. Therefore, it is proposed to grant the General Director with unilateral authority to extend such period to up to a total of 120 days (excluding the initial 30-day period, i.e. a grand total of 150 days). This proposed amendment removes the checks and balances existing today with respect to the duration of a merger review, and would deny the parties the ability to turn to judicial review by the Antitrust Tribunal if they feel the review process is prolonged without ample justification. Other proposals include enhancing transparency of the merger review process by requiring the publication of an abstract of the records and minutes of meeting of the mergers and exemptions committee; and expanding the General Director’s investigative authority regarding disruption of proceedings in antitrust violation cases. Currently, such investigative powers are limited to disruptions during the General Director’s inquiries. The amendment will broaden the scope of investigation to disruptions prior to the commencement of the inquiry (such as destruction of evidence regarding cartel agreements or tender coordination, intended to obstruct future investigations). In December 2014, the recommendations of the Import Committee to reduce barriers on import were adopted by the government. This proposed amendment seeks to apply the prohibition on the abuse of monopoly power to authorized distributors that do not hold a monopoly position, to the extent that their behavior impairs or impedes parallel import. The proposed amendment also authorizes the General Director to issue orders against authorized distributors that abuse their position and cause potential significant harm to competition from parallel import. Such authorized distributors may be subject to criminal sanctions (if intent to reduce competition from parallel import is proven) and administrative sanctions. Editor’s Note: David E. Tadmor is a member of XBMA’s Legal Roundtable and the Managing Partner of Tadmor & Co. Mr. Tadmor is recognized as a leading expert in the area of Israeli competition law. He served as the Director General of the Israel Antitrust Authority (IAA) from 1997 to 2001. This memo is written by Amir Scharf, head of Tadmor & Co.’s Capital Markets & Securities Law Department, and associate Oren Ofek. Executive Summary: In recent months, there has been a renewed legislative effort to enable the offering of units (“Units”) of foreign mutual funds (including exchange traded funds, or ETFs) (each, a “Fund”) in Israel. The proposed legislation will allow foreign Fund managers who meet certain criteria to publicly offer Units in Israel. Currently, the distribution and offering of Units requires the filing of a prospectus in Israel and compliance with other legal requirements, including ongoing reporting and disclosure obligations. In addition, Israeli law prohibits Israeli banks, the primary distribution channel of Funds, from receiving fees for distributing Units from foreign Fund managers. The proposed legislation, if adopted, will enable foreign Fund managers, following receipt of approval from the Israeli Securities Authority (the “ISA”) (after filing a fairly simple application), to publicly offer Units to retail clients in Israel, relying on reports issued by such foreign Fund managers in their country of origin. As proposed, there would not be a need to file a prospectus in Israel or to comply with significant ongoing reporting or disclosure obligations. The Units may be publicly offered through local or foreign investment advisors, through the Tel Aviv Stock Exchange, or both. The foreign Fund manager must manage no less than five Funds, the units of which have been publicly offered for at least five years, with each Fund having assets with a total value of at least US$500 million during the preceding two years. The total value of the Funds’ assets and client portfolios managed by the Fund manager, any person controlling the foreign Fund manager, and any entity controlled by such person, must be at least US$20 billion. The value of the foreign Fund’s net assets must be at least US$50 million, and its units are available for purchase in Europe or the United States. The foreign Fund must operate under the U.S. Investment Company Act or the European directive UCITS. The price of the Units must be regularly published on a website and be available to the public without cost. The foreign Fund cannot specialize in investments in Israel. The foreign Fund manager must deposit a bank guaranty issued by an Israeli bank of at least ILS 1 million (~US$285,000) for the benefit of the ISA, or place a senior lien and floating charge, in favor of the ISA, on a deposit in such amount placed in an Israeli bank. The foreign Fund manager must deposit ILS 3 million (~US$860,000) in an Israeli bank account. The foreign Fund manager must appoint a representative in Israel to serve as liaison between such manager and the ISA and between such manager and the Unit holders in Israel. Based on recent data, the total value of the mutual fund market in Israel is, as of January 2014, over US$66 billion. Only 4% of such amount is invested in funds that specialize in securities traded outside of Israel. The entry of foreign funds into the Israeli market is expected to substantially increase the total value of mutual funds held by the Israeli public, particularly with respect to funds that invest in securities traded outside of Israel. The legislation process described above seems to be in its final stages, and we expect that it could conclude by as early as the end of June 2014.